SUP Yoga is making waves in the yoga world – but are you still hesitant to test the water? Sure you’ve heard all the fitness and meditation benefits of a class on the beautiful blue ocean… but isn’t it too challenging? Is it even a real yoga class? What about alignment onboard a floating yoga mat? Get ready to grab yourself a board as we throw these three common myths about the practice out to sea! This is because is most poses in a SUP Yoga class are either sitting, on the knees or reclined on the back. These are stable poses on the SUP board and so don’t need much balancing. That’s not to say that SUP Yoga doesn’t have something for those who like a challenge. Standing poses, arm balances and inversions become more demanding as they require core strength, balance and concentration, so the board is a great place to increase your skills in these areas. However, in a SUP Yoga beginner classes these poses will only be a small part of the practice, so there is no reason to fear giving it a try. Myth 2: SUP Yoga isn’t real yoga, it’s a novelty. Certainly there is an aspect of fun to practicing yoga on a board floating in the ocean, but SUP yoga still delves us into the deeper aspects of yogic philosophy and brings us closer to the experience of chitta vritti nirodhah – cessation of the fluctuations of the mind. The sea is a powerful, mystical place to practice yoga. The SUP Yogi draws on Indriya – the senses – to become completely mindful in the present moment. In the ocean, there is so much to focus the wandering mind; the sound of the water lapping under the board, the sight of soaring sea birds, the smell of the sea salt, the feeling of the breeze on the skin. This allows you to become totally captivated by the surroundings, accessing a deep state of meditation and relaxation. Science shows the human body to be made up of up to 75% water. We are water. We came from water, growing and developing in the womb. The ocean recaptures this essential human experience of floating and being supported. Mantras specific to the ocean are chanted to further connect the SUP Yogi to their true nature, the present moment and to the greater universe around us. SUP yoga practitioners are encouraged to practice Ahimsa – non-violence – the first of five yamas – moral guidelines – on Patanjali’s eight-limbed yogic path. Ahimsa encourages kindness toward the self and all beings. SUP yoga teachers are ambassadors of the oceanic environment, practicing non-violence to all living creatures and passing this message on to those who practice SUP yoga. A greater appreciation and gratitude for our mother earth and the ocean is a natural consequence of connecting deeply to the environment around you on the board. 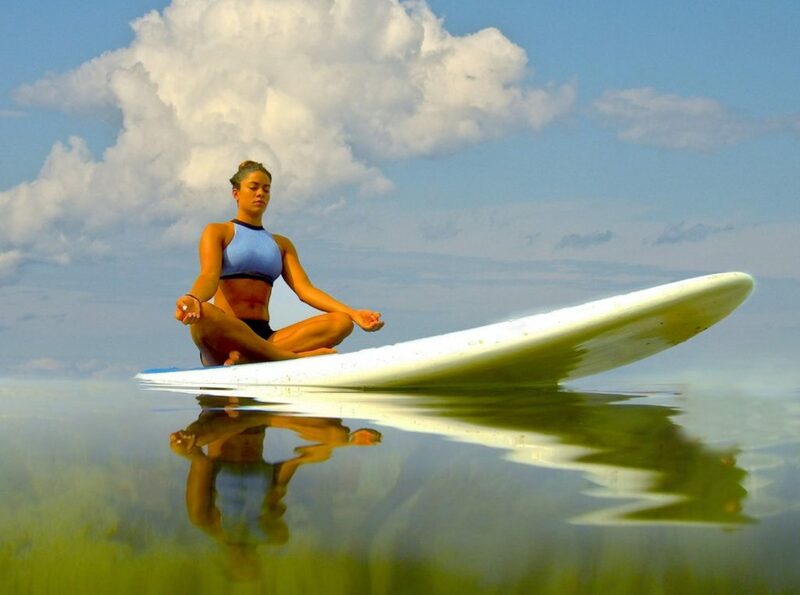 SUP Yoga encourages an even greater awareness of the qualities of the yogic breath; dirgha – long – and sukshma – subtle . SUP Yogis rely on this connection to the breath to keep poses steady on the board, encouraging balance, self-focus and concentration. This also brings us into a greater state of meditative stillness and connection. For seekers on the yogic path taking your class to the water combines all the benefits of a traditional class with the magical experience of connecting and being supported by the beautiful big blue ocean surrounding us. Grab a board and join the many SUP Yogis finding that peace really is floating out to sea. SUP Yoga teacher trainings, workshops and Yoga/ SUP Yoga retreats.